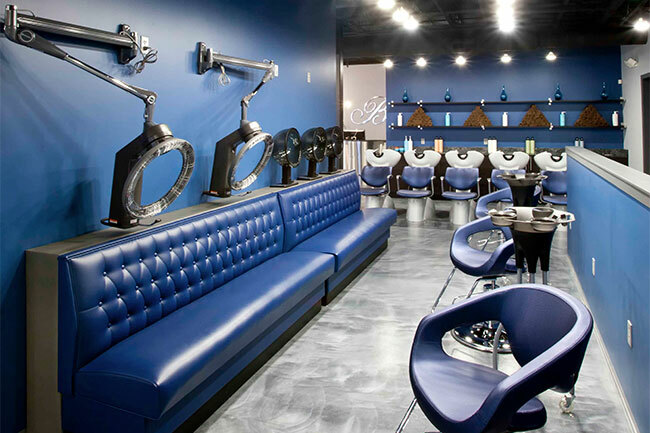 From New York to Los Angeles, from Paris to Tokyo, Takara Belmont is recognized as the innovative leader in furnishings and equipment for beauty salons, spas and barbershops. Our selection of online and showroom products provide a mix of exclusive product options and offerings for the cutting edge products you love. Check out our gallery below for more inspiration and custom product offerings. 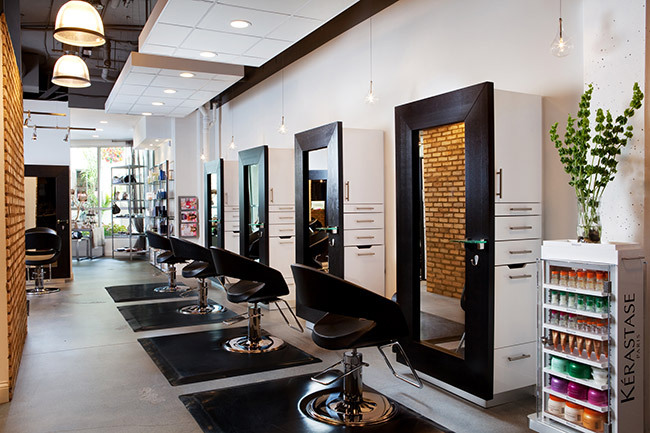 The sleek curves and minimalistic appeal of the Caruso Styling Chair adds stunning contrast to this urban-chic salon and boutique in California. 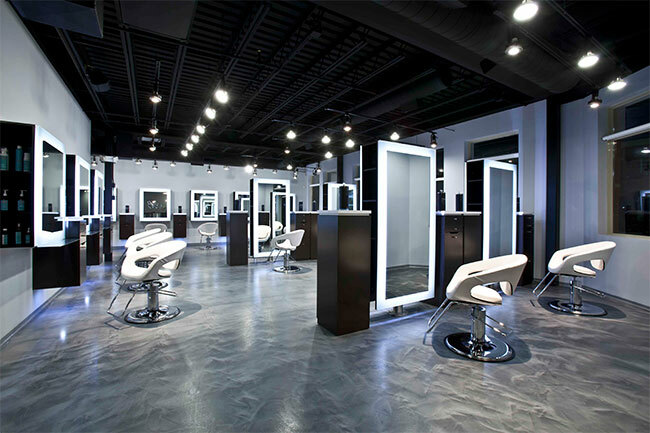 As an ideal and functional solution to storage concerns, the Custom Koken Styling Station features a darker mirror border with a lighter body to create a smaller visual footprint for this California salon; creating the look-and-feel of an uncluttered, open space. 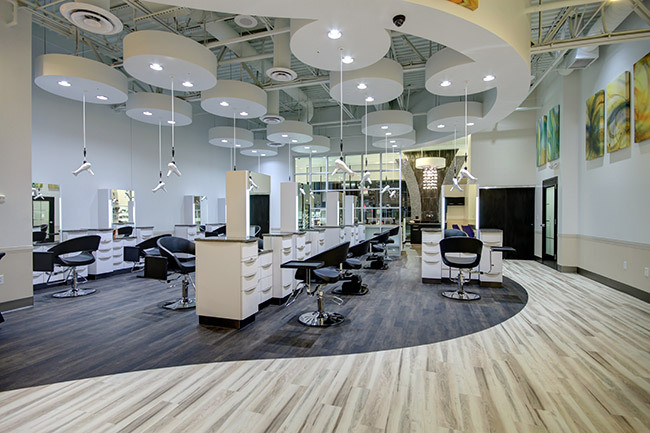 The art of hair and client experience is the focal point of this California salon & boutique, and the Liberty Shampoo Unit’s customizable bowl, base and vinyl color options makes it a premier choice to complete the look of any space. 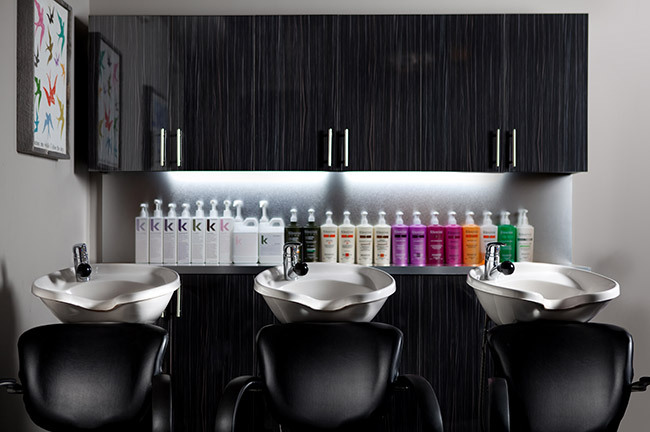 With bright under lighting, the Custom Koken Back Bar highlights retail products within the salon and provides ample storage space for shampoo service items. 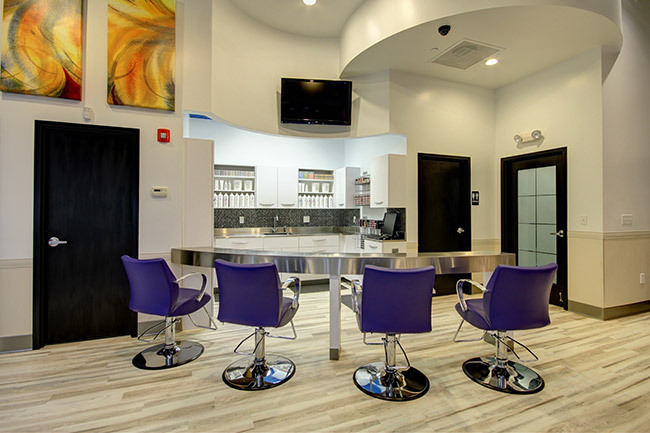 The Custom Koken Front Desk provides a separation between the reception area of Bombshell and the service area; the light laminate adds to the open feel of the space. 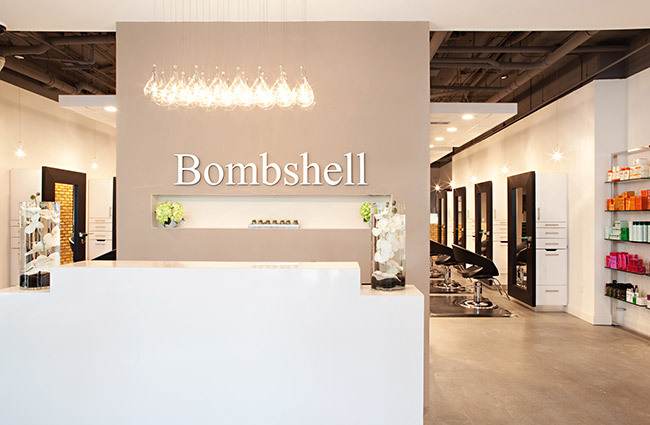 Bombshell Salon & Boutique is a full service, “urban chic,” hair salon and advanced skincare center featuring master colorists and hair extensions. 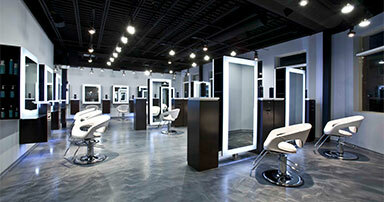 It is a minimal and clean aesthetic which places the art of hair and its client experience as the focal point. 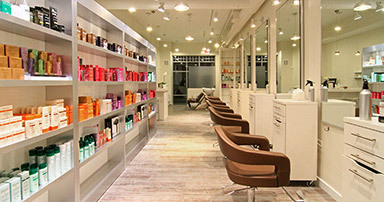 Bombshell features the Caruso Styling Chair and other offline products including Liberty Shampoo Units and custom products including Koken Styling Station, Front Desk, and Shampoo Back Bar. 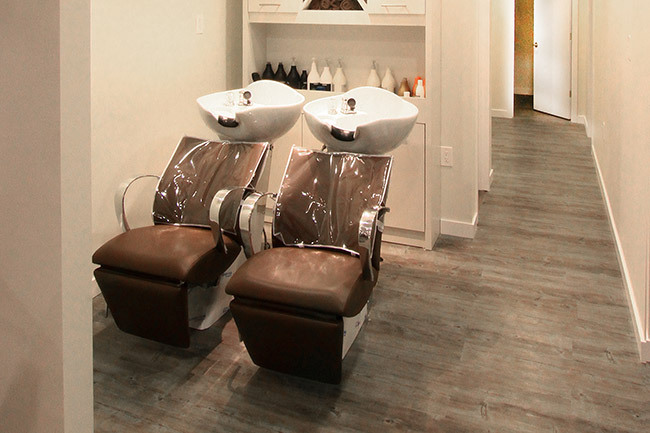 Noted as a clean and simple Miami-based salon space with a dramatic shot of sophistication, the Eave Styling Chair offers a uniquely luxurious, extra-wide seating solution for this Miami salon. 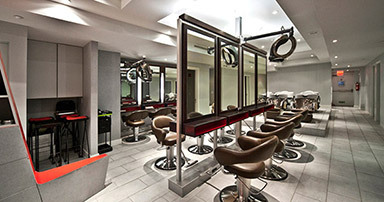 From the crystal chandeliers and polished porcelain floors to the plush design aesthetic and glimmering stainless steel arms of the Bahama Shampoo Unit, this award-wining space is inspired by the sophisticated elements of an elegant jewel box. 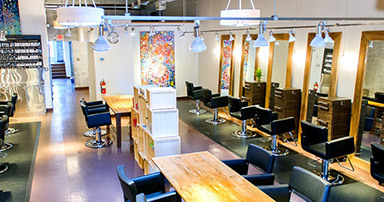 Danny Jeleca Salon is an award-winning space that is noted as a clean, simple space with a dramatic shot of sophistication. 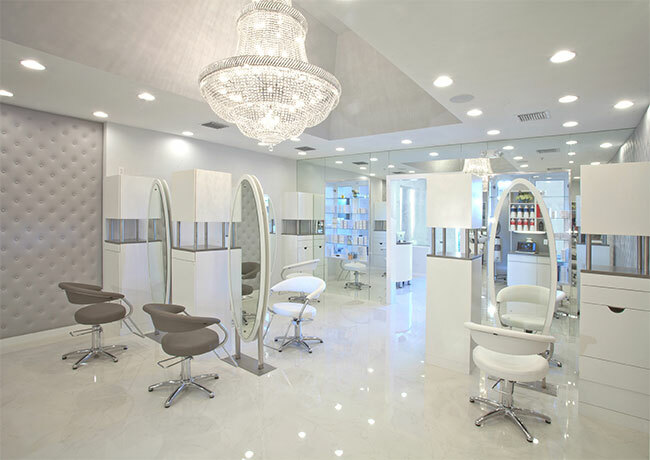 Elegant from top to bottom, the salon design is inspired by a jewel box, which can be seen from the crystal chandeliers to the polished porcelain floors. 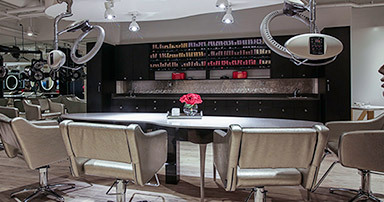 With an elegant, slim profile for the Roller Ball F Stand-Type, the wall-mounted option provides Roy Teeluck Salon with a multi-processor that not only enhances color and chemical treatments, but saves space within the salon. 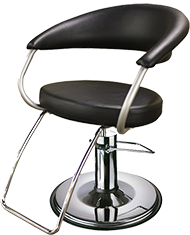 Dark upholstery, plush seating, and advanced ergonomic principles for minimized pressure on the lower back makes the Nagi Styling Chair a stand-out selection for this trendy, New York-based salon. 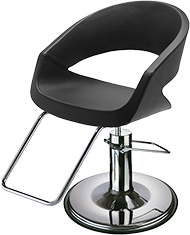 The curved, sensual nature of the Caruso Styling Chair matches the Yin-and-Yang concept of the salon; upholstered in black, it also creates a complementary balance to the white styling stations and architectural details of this award-winning salon. 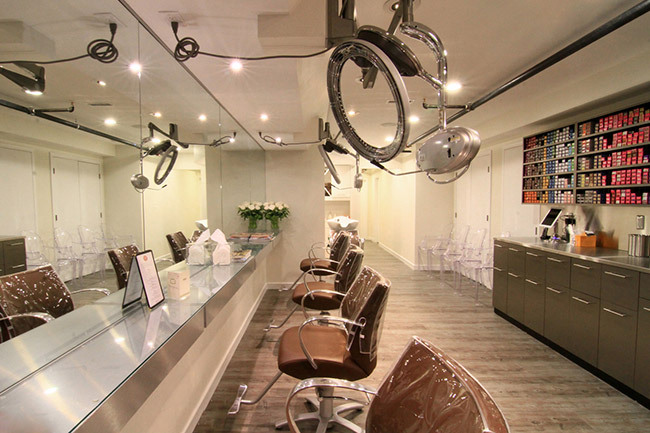 With the rotational swivel of the Assista Tray to the styling chairs, it adds to the sense of vitality and movement within the salon and balances both function and style to help each artist complete their vision. 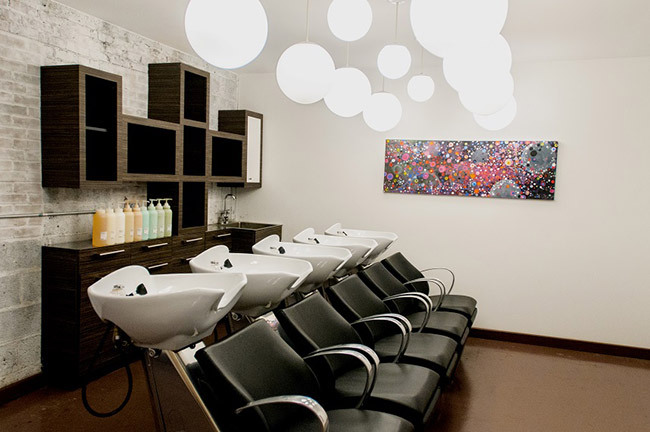 Bright upholstery on the Lioness Styling Chair at the color bar area adds an explosion of colorful splendor to the open layout and gallery-esque theme of this Missouri-based salon. 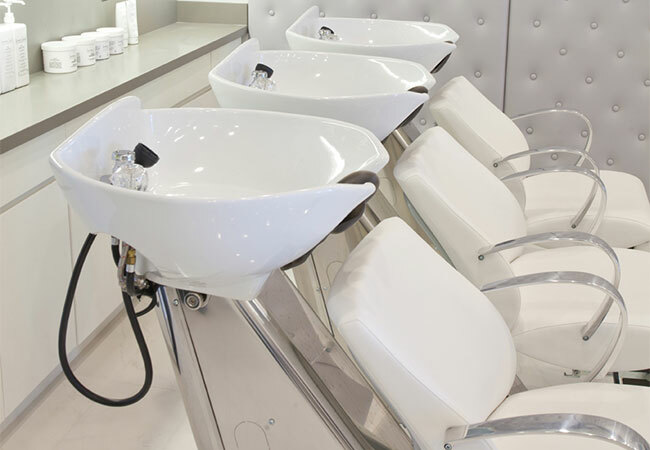 A unique lounge-style comfort and sleek, black-and-white look to the Oregon Shampoo Chair adds to the dramatic statement of this Yin-and-Yang inspired salon – all the while providing the harmony of extra storage behind each shampoo unit. Featuring a similar design aesthetic as the Caruso Styling Chair, the Striptease Styling Chair highlights the elegant style blue, white and silver color palette of Blo Salon. 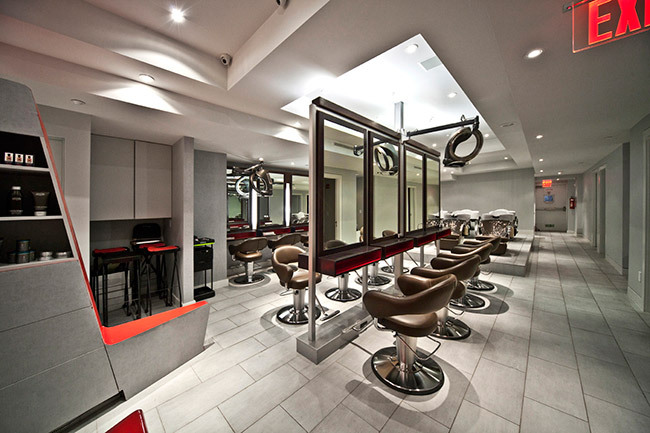 Functional from both sides, the Double Pedestal Mirrors provides a center-stage station in Blo Salon. 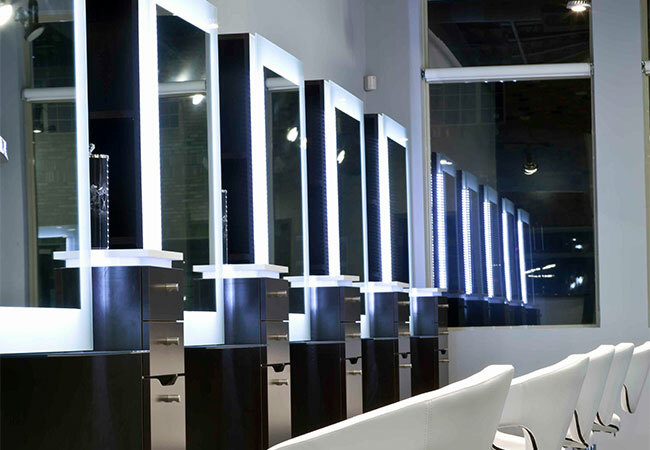 The fully-illuminated border of the Custom Koken Wall Mirrors provides ample lighting for clients to truly appreciate their color, cut or style! 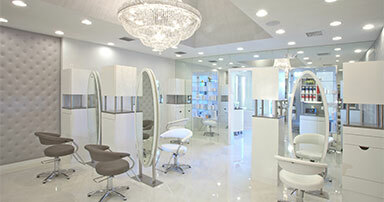 It also adds lighting interest within the stunning lighting design of this Michigan-based salon. 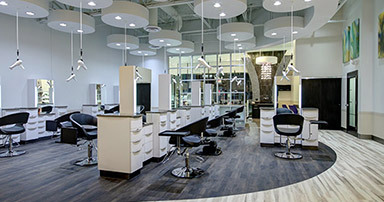 The predecessor to the new and improved Roller Ball F Multi-Processor, the original Rollerball II wall-mounted version provides a small, yet powerful footprint for Blo Salon’s processing needs. 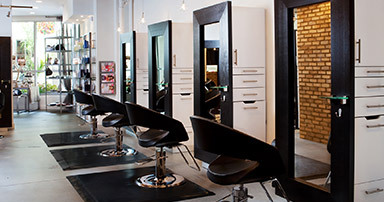 Light and mobile, the Jellyfish Color Cart provides Blo Salon with a one-stop option for color needs; it can be tucked away next to the color area or wheeled over to each individual styling station. 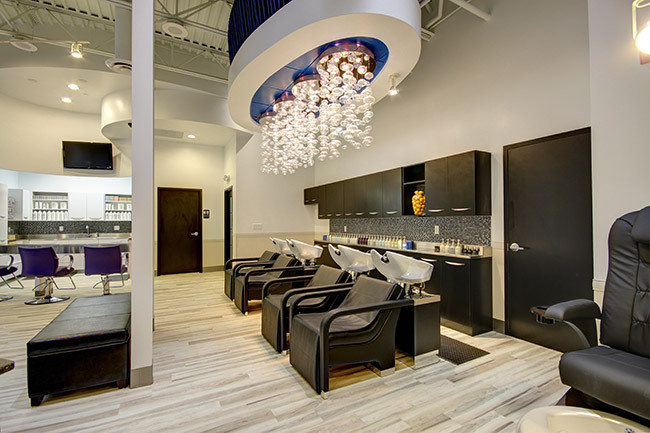 Soft edges and geometric panels of the Luxis Styling Chair make it an ideal match for the industrial-esque elements of this luxurious Ohio riverside salon. 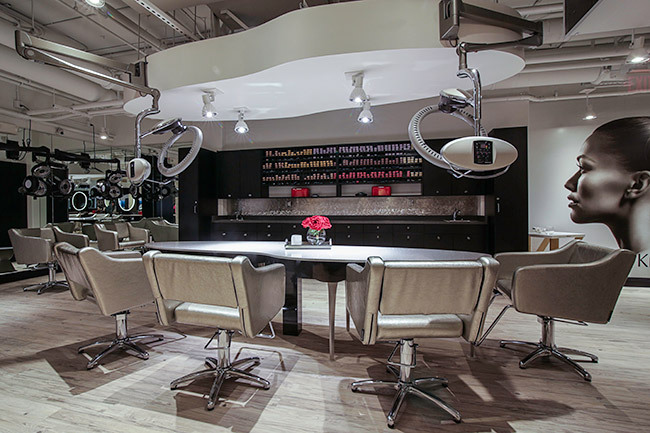 With an elegant, slim profile for the Roller Ball F Stand-Type, the silver wall-mounted multi-processor not only enhances color and chemical treatments, but saves space within this urban-chic salon. Vivacious wood grain curves and eco-friendly character of this Forest Stewardship Counsel certified chair balances the natural beauty and modern style of this Malibu-chic finishing studio. 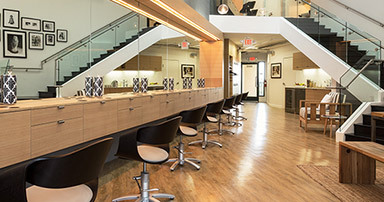 The open back, distinguished structure and symmetrical nature of the Bossa Nova Styling Chair balances the raw, structural beauty of this Zen-inspired salon. 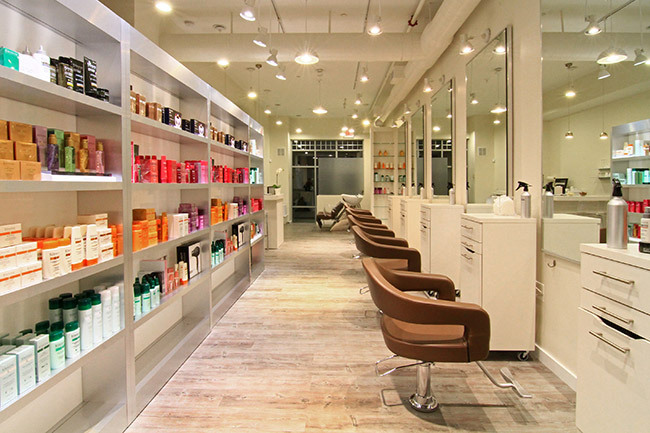 Soft, spherical lights staggered in succession promotes the positive-energy atmosphere of this Red Bank salon; paired with the luxuriously comfortable Bahama Shampoo Unit’s leg rest feature, clients are able to fully enjoy a peaceful shampoo experience. 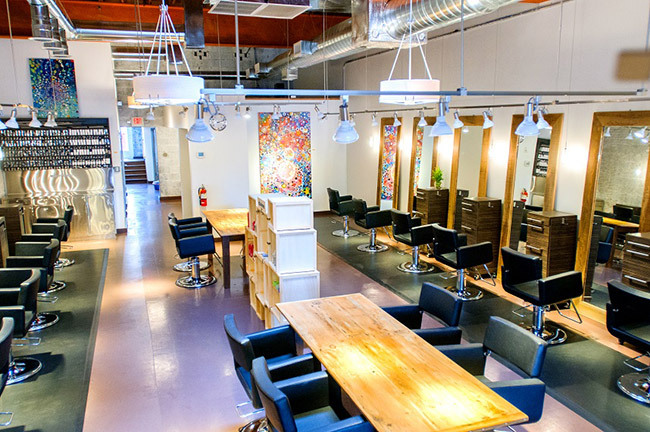 Comfortable with a sophisticated look, the Knoll Styling Chair paired with the small footprint of an FMB base maximizes space within this art studio and homely living space-inspired salon. Upholstered in a neutral color with a curved back support and polished armrests, the Bahama and Lioness balances the partially exposed, airy architecture with the warm and inviting neutral tones of the space. 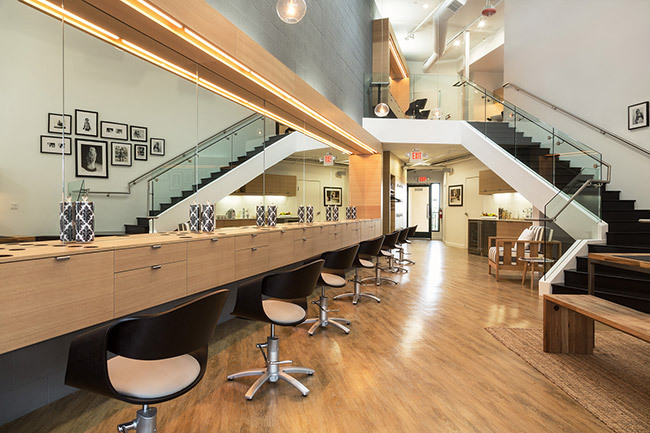 With an elegant, slim profile for the Roller Ball F Stand-Type, the silver wall-mounted multi-processor not only enhances color and chemical treatments, but saves space within this art-studio style salon.